In my paper, I focused on Wen Zhengming’s (文徵明) (1470–1559) albums, poems, and records concerning The Garden of the Unsuccessful Politician and compared them with Zhang Hong’s (张宏) (1577–1652) Album of Zhi Garden. These two works are respectively from the middle and late Ming dynasty (1368–1644). Through exploring their visual representations, we are able to gain a greater understanding of the major shift of visual vocabularies and Chinese garden culture in the middle and late Ming dynasty. 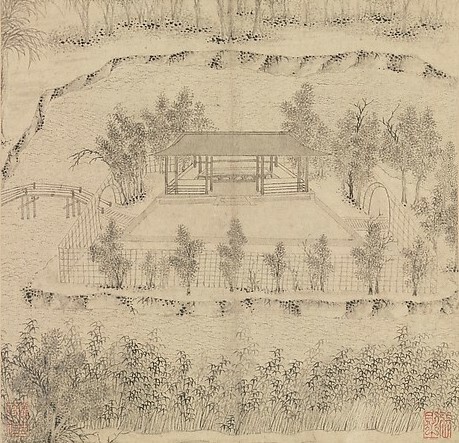 In Wen’s album, each leaf is relatively independent and offers little information regarding the overall layout of the garden. Leaving more empty space for the imaginative and less descriptive features, his album not only evokes the owner’s subjective sensory, intellectual, and emotional experiences, but also ours, thus transcending the boundaries of space and time. On the other hand, Zhang Hong’s album of The Garden of Zhi, functions more like a continuous “visual report” in which we are able to get more descriptive information from an aerial perspective. He renders the scenes as continuous as possible to mimic the real experience of the exploration of a garden. In addition, I also analyzed differences in the elements that comprised the gardens — plantings, rocks, architecture — and human activities shown in the two albums. These differences, I propose, are reflective of the way that these garden paintings indicated the owner’s position within his social network and how the social functions of gardens changed over time.